The Jewelry Arts curriculum of JewelryTraining.com is exceptional and is a comprehensive hands on program with intense individual instruction, testing and professional equipment. We have developed this program to give you a thorough knowledge of metal art, jewelry design and gemstones. Starting in 1979, we have provided more of an individualized curriculum so the beginner, intermediate or advanced student can achieve their desired goals. Class tuitions have been reduced, sessions and multiple sessions vary depending upon subjects covered, i.e. soldering., setting, etc. Each session is six weeks but some are more than one session, i.e. stone setting takes two sessions to complete and sometimes added classes are requested. The qualified person may have one week at no extra charge (generally by scholarship or other benefactor). You can enroll with absolutely no experience and expect to receive a full well rounded education. When you enroll as a student with experience, credit may be given for that experience. Apprenticeships are given when available and placement assistance is provided. 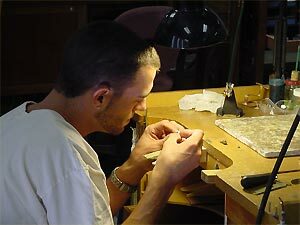 Often students attend CIJT after attending other jewelry and gemology courses to refine additional professional knowledge. *Melanee S, Danville. The successful completion of our many programs can provide graduates with knowledge necessary to obtain various certificates in Jewelry Making and Repair, Jewelry Arts, and Advanced Jewelry Arts and can prepare student for testing for JA Bench Certification. CIJT does not offer specific certification but instead strong skills for each program of study. State of the Art - 20 individual work stations and custom apprenticeship program* - your special/studio space and personal area to work. Schedules can be customized to meet your schedule From 7 hours per day (Monday - Thursday), with open lab available. Each session is approximately 210 hours, some sessions are less hours and/ or a combination of one two or more skill sets. A beginnner generally starts with Beginning Fabrication. No sessions are in excess of $2400.00. There is a registration fee of $150.00 and a tools and supplies fee - With each session, there is a tool kit. Session one tool kit is approximately $450.00 or school tools are available for rental. Many Saturday Workshops now available. Workshops - $76 and up. You may also call us on (800) 731-1122.